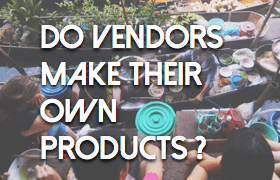 You are here: Home / Blog / Do Networking Vendors Make Their Own Products ? Do Networking Vendors Make Their Own Products ? Networking vendors do not make all component of their networking device, or even most of them. This includes the operating system and the applications on the device itself. Incumbent vendors vendors have very similar product development models because their applications have identical outcomes and must be interoperable. 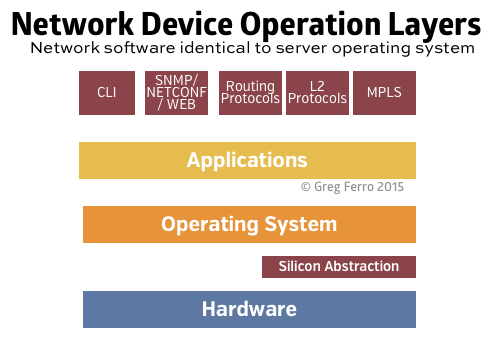 Applications such as routing protocols, management interfaces, and silicon modules are often purchased from third parties such as Tail-F or IP Infusion. Understanding of the hardware & software architecture in networking hasn’t been a big issue for the last 20 years. Mostly because vendors sold integrated solutions and it wasn’t necessary. In the end, a network device has similar architecture to any other computer and vendors are mixing & matching the available software & hardware components to sell to you. I often wonder if this why there are so many bugs ? Producing a seamless product that has been assembled from dozens of vendors is really quite difficult and requires excellent team of in-house engineers to ensure that quality is maintained. In times of shrinking profit margins and pressure to reduce head count, this might be the first area to take the hit. Any thoughts ? Something I’ve missed ? Hit the comments, I will be watching. PS: Montavista Linux is commercial distribution optimised for use “Carrier Grade” networks. Arguably, all Linux versions are carrier grade because carrier services aren’t actually that reliable nor do they need to be. Great article Greg, I wonder where the value is? My first thought is always ‘services and support’ but then why the hardware/software markup? Still, if the market will pay, why wouldn’t you sell? Totally agree where Linux is concerned, it’s now a very mature and solid platform. Talk of $X grade Linux makes me laugh, it’s always been remarkably solid and that only improves over time. It’s an area I’m actively working in and researching and I’ve been blown away. As you mentioned somewhere (Network Break?) recently regarding HA Proxy, FOSS solutions are quickly reaching parity with commercial ones. I wouldn’t put money on F5, or even Juniper & Arista as I may have a few years ago (metaphorically speaking). If not hardware, if not software, what are the vendors good for? Where is the value I want in return for my money (sorry, investment)? Sure ‘Enterprise’ will, for the moment, stick to the old playbook, but really, how long till they really, really can’t justify not ‘outsourcing’ large parts of the infrastructure. Fast, low latency networks, POPs, APIs with TLS transport encryption, partial payload encryption and all the rest. There are already many long in the tooth examples such as Visa, Mastercard, Link and others I can’t remember. These can be slow lumbering dinosaurs but a new ‘association’ is sure to form as the math becomes more attractive by the day. Best move on before this becomes a blog post. FYI: These companies are often based in China & India since it takes large << needs an ending. And remember, the business has way more costs that just development. The skilled people brought in to consult before the sale, brought in to install/configure/shake out a new installation, and who answer the phone are all real costs too. Oh, and amortize ASIC and other hardware development costs over units sold. So I would argue the disaggregation of servers had everything to do with economies of scale in software development, catalyzed by Microsoft putting a billion dollars of venture capital on the table (and some really talented people) to develop Windows NT and evolve it as a server OS. And kudos to the Linux intellectual property model and the community which drove it from its early days in the 1990s to critical mass as a server OS in the early 2000’s. Steve, one thing might be different this time – open source momentum and speed. OpenStack has achieved similar number of lines of code within 4 years and is on the edge of enterprise adoption. That was fast. Large users (with a lot of talent) will tend to use open OS (instead of paying for commercial or develop their own), write their own modules and contribute back because it makes their hiring (and employee ramping) a lot easier. Vendors will join and contribute, because it is cheaper and less risky way to get to product (new players might be less ashamed to disrupt market, what if RedHat weights in?). In this world you pay partially for polished package and hardening, but most money go to support. When it make sense for HP, RedHat, Mirantis, Rackspace, IBM and increasingly even for some unexpected ones like Cisco and VMware, in openstack IaaS, why this would not work for switch OS? OVS is quickly moving to become defacto only choice for vSwitch, why not something for pSwitch? Can this compress 20 years to 4? I look forward to the day I can buy one vendors switch and another vendors OS. I think you’ve been able to, for a year. ONIE from OCP (contributed by Cumulus) unlocks the boot process from both the hardware and the chosen software. Cumulus and Pica8 have been joined by other entrants, and buying white boxes directly from the ODMs have been joined by some traditional vendors. 1. This disaggregation tends to work best when there’s a single ASIC family for the software vendors to focus on. In servers, one price of disaggregation has been the decline of other CPU architectures in favor of Intel x86. In data center switch disaggregation, the market already seems to favor a certain line of Broadcom switch ASICs. Is it time for the market to make a single choice yet, to the exclusion of all competitors? 2. Do the available disaggregated switch software sets have the features you need yet, and at current pricing will they be able to invest to achieve those feature sets? 3. Will you have staff to support the combined software and hardware you want to deploy as switches? If not, who do you intend to call, how will they be funded, and (given that replacing broken hardware is the easy part) what will they do when your call is about a software bug it takes CCIE level talent to even understand the description of? Hey Steve. I’m really enjoying your responses and insight, thank you. Fair warning regarding your first question, part of me want to respond with something like “well, you can’t have it all” and another part “who cares”. Despite that, on balance, I agree its something to consider further and a potential risk that could have wide implications. It feels like something that is out of the end user’s control, which isn’t too different to the situation today. Old master to new master, very depressing; kinda takes the shine off. Your second question isn’t of too much concern in my opinion. The core feature set is already there and allows for many common designs and architectures. Adding what’s missing won’t require 10m lines of code (or even the hiring of a single developer). I can’t be fully confident of course, I’ve not done this in the real world and hardware may yet be an issue. Larger players don’t need the vendors at all, smaller ones will be happy with what’s available now. The middle ground will be increasingly well served I’d imagine, but there are no guarantees. Finally, good staff will learn and adapt quickly, bad ones won’t. Good companies will train and invest, bad ones won’t. The user community will expand and absorb talent from other areas. Paid support and consultancies and all the rest will be around for a long time yet. That’s not to say I don’t have any doubts about the ‘new dawn’, I’m sure it won’t be a smooth, harmless journey, life and business don’t work like that. Those that benefit from todays status quo won’t give it up easily. Selfish and destructive interests will play there part I’m sure. Lots of moving parts in networking, and in delivering a stable and reliable network product, aren’t there? I think it’s useful to think of this discussion in terms of a value chain with a series of discrete steps where component technologies (both hardware and software) come together in the finished product a customer sees. First is a product concept. Servers have over the last 30 years reduced this to a single design, an Intel x86 CPU with the DRAM DIMM configuration it dictates, the base I/O a companion ASIC offers, and slots for a small menu of PCIe connected I/O devices. Networking still has diverse requirements — on the packet processing side do I need extreme flexibility dissecting and rewriting headers, or is a hardwired forwarding pipeline good enough? Am I in a service provider central office, a data center, a wiring closet, or in a locked box under a cell phone tower? Is the administrator a deep network specialist, a DevOps type, or a novice? Second is the choice of where the software is coming from. A modern full function switch/router software set is in excess of 10 million lines of code and takes well over a decade to develop from scratch and harden, so other than open source — and other than very focused applications — I believe we’re past the point of starting new ones as an industry. Server operating systems are comparable, with no truly new ones since the mid 1990s. Third is the choice of where the ASIC (or ASICs) are coming from. This is a make vs buy, and it is a business decision (not a technical decision). There are only two reasons for doing your own ASICs: first is to have a capability your competitors don’t, and second is to get under your competitors’ cost structure in a sustainable way. There are two reasons not to do ASICs: first, it’s an extraordinarily expensive investment, and second if your people stumble (or a competitor shines) it can make your products uncompetitive for an entire technology cycle, 2 or even 3 years. Note also that for a full function network stack meeting ASICs with very capable packet processing, regardless of how good a job people did on the abstraction layer, there are simply far too many touch points between the software and the ASIC to rework (or even test) quickly. The switching cost from one ASIC family to another (including from make to buy and vice versa) is extraordinarily high. So there’s a lot of momentum on the architectural choices a product family makes up front. Now within the ASICs there is “intellectual property” being brought in, not the least of which are the pad designs for the latest speeds. But these can also include little ARM cores, PCIe interfaces, memory interfaces, and the like. It is the responsibility of the ASIC designers to correctly integrate the pieces they buy. Similarly within the software modules can be brought in, say a new protocol. There has been a lot of discussion about the value of replacing 100,000 lines of real time operating system under a given 10 million lines of switch software with a different real time operating system host over the years. The truth is that if the OS is just there as a boot launcher for a 10 million line of code real time system, jacking the house up off its foundation to pour a new one is a pointless exercise which will introduce cracks in the house. The reason to change out the OS is to shift engineers away from infrastructure and onto features customers can see instead. Enough said. Again, the software integrators are responsible for making sure any code they bring in from outside works, and that their code can be loaded by whatever boot process the switch uses. Looking at detail hardware design, or the shifting of detail hardware engineering to sit next to manufacturing when the manufacturing is subcontracted, is really unimportant. Yes, I yearn for the days 30 years ago when the detail hardware engineering was done by people who worked for me, and manufacturing by people downstairs in the same building, and I could watch the product actually being built and drag my engineer over if they’d done something which was impacting manufacturability. But reality is modern manufacturing equipment, and modern environmental standards, drive manufacturing to large centralized facilities. Allowing detail engineering to sit next to manufacturing is the right tradeoff. Of course, the product company is solely responsible for managing its manufacturing / ODM partners.